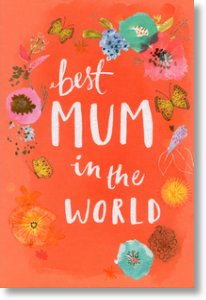 Let your Mum know they're the best in the world with this glorious Mum Birthday card. Creative lettering on the front design is wrapped around by a colourful garland of painted flowers, all set on a colourful red background. The front design is enhanced with glitter detail of the lettering and the inside of the card has a full colour print continuing the theme.